If you’re looking for a high quality, high contrast custom tattoo, carried out in a hygienic and professional environment – I’d love to talk with you. 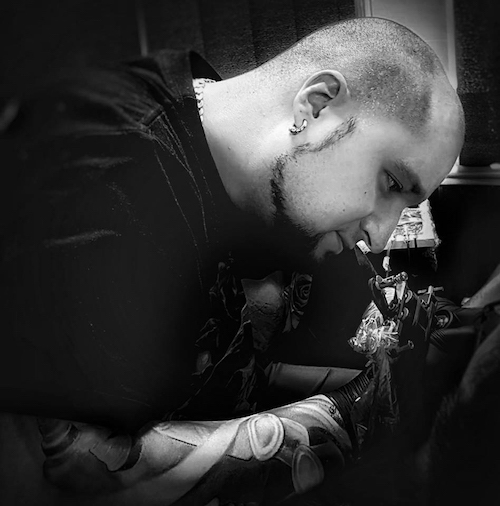 I’m a highly respected and experienced tattoo artist operating out of the renowned Inkden Tattoo studio in Blackpool, Lancashire. Please say Hello! Visit me at Inkden Tattoo Studio in Blackpool for a friendly, professional consultation. With more than 7 years of experience, I have made it a personal goal to become a leading tattoo artist in the North West area, and to experience everything this industry has to offer. To create great tattoo art, you really need to know your stuff. I have worked across England, Germany, and Latvia to perfect my style, and develop my own technique. Bold and vivid colours can be a fantastic addition to a wide range of tattoo designs, while subtle colours really highlight areas of interest and add depth to a design. Black and grey tattoos match every outfit, and suit every mood. With long lasting and effective shading techniques, a 3-D effect image can be created using only black and grey ink. Latest Reviews on Facebook. If you’d like to leave a review please click here. I’d appreciate it. Using black and grey, as well as colour, realism is a tattoo style intended to look as lifelike as possible. Shading techniques are used to add depth to an image, with the intention of creating something lifelike and substantial. Something personal, like a photograph, can be reproduced right on your skin using this style. A tough style to get right, quality tattoos in the realism style really stand out. Black and grey tattoos match every outfit, and suit every mood. With long lasting and effective shading techniques, a 3-D effect image can be created using only black and grey ink. Sometimes white ink can be added in to create highlights, and to really draw attention to particular aspects of the work. Bold and vivid colours can be a fantastic addition to a wide range of tattoo designs, while subtle colours really highlight areas of interest and add depth to a design. Whatever type of colourwork you want, here at Vitaly, we use the best ink, and the best equipment, to make sure the end result is long lasting and effective. Classic tattoos in the Western Style are known as traditional tattoos. These often incorporate strong outlines and bold, vivid colours to really define the space and create a stunning piece of body art. With good aftercare, a traditional tattoo will last a long time, without needing to be touched up. One of the most incredible forms of art, pointillism creates an image by using thousands of dots of colour. It’s all about how the eye perceives these dots that makes this style so impressive. In fact, the intense luminosity of colour this technique creates is truly astounding! Send me an email using the form below and I'll get back to you as soon as I can.